Long black satin slit dress, sleeveless, asymmetrical length, applied ruching inset embellished with contrasting “Piercing” button, bustier neckline and invisible zip on the side. 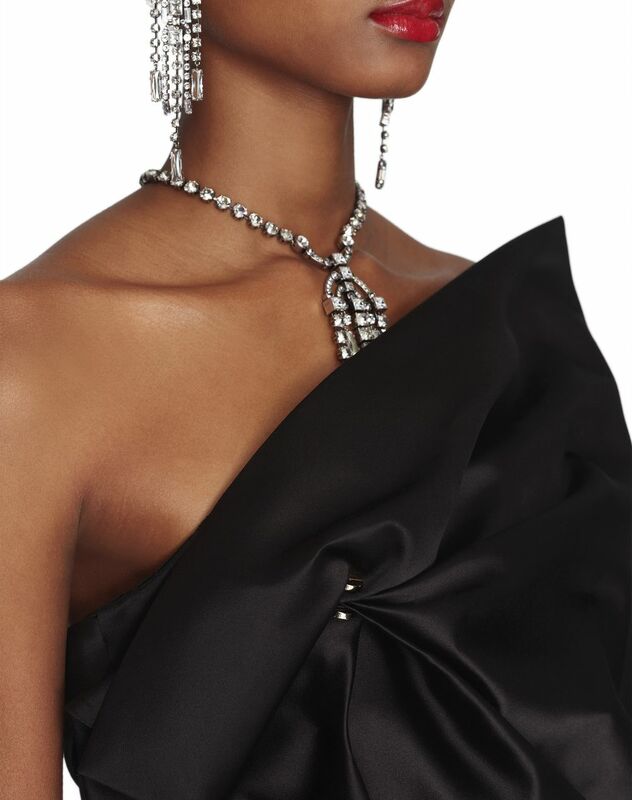 An emblematic piece from the collection, this evening dress stands out for its couture details and asymmetrical cut—a testament to Lanvin’s expertise. Embellished with a “Piercing” button detail, the draping creates elegant, feminine allure. Radiant and sophisticated, this long dress will become an iconic piece in your evening wardrobe. Main materials: 72% viscose weave, 28% silk weave. Model's measurements: Height: 179 cm Bust: 72 cm Waist: 57 cm Hips: 87 cm Model wears a size 8. Made in France.